Book Blogs Found on Friday! – It's Time to Read! Book Blogs Found on Friday! Hi, Love your blog & love discovering new friends through Friday’s Memes!! Gives me something to explore throughout the weekend!! I’m attempting to start a Monthly Bookclub on my blog if you want to pop on by!! Happy Friday!!! 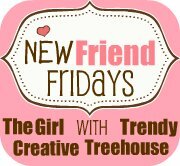 I am visiting from NFF @ The Girl Creative! I love your blog!! And I LOVE books!! I really enjoy Driscoll and Piper as well. Have a wonderful weekend!! Hi! Found you via the hop, look forward to following you! Thanks for commenting on my blog! I look forward to reading your blog. Thanks for stopping by, Katie. I noticed your link for audiobooks and wanted to tell you about the audiobook discussion that’s been going on all week at Devourer of Books. I haven’t written a post about it today; but here’s the one I wrote yesterday. I just recently began listening to audiobooks and have learned quite a bit from Jen’s blog. Be sure to tell her that I sent you. Hey, thanks for stopping by today! I’m now following you here, great blog!